With the exception of businesses in a few lagging industries, small businesses in the U.S. are seeing the healthiest profit margins in a decade, according to new research by the financial information company Sageworks. With pre-recession sales growth and profitability rates reflected in their 2014 statements, privately held companies are “in very sound financial shape,” according to Sageworks, which reports that net profit margins averaged 8.1 percent—a 24.5 percent improvement. What about those industries that are not keeping pace? The Sageworks examination of net profit margins (adjusted to exclude taxes and include owner compensation in excess of market-rate salaries) from the year ending last month also identified the least profitable U.S. industries. Top of the least profitable list: despite the national boom in microbrewed beer consumption, it’s beverage manufacturing, with a 0.3 percent profit margin. Oilseed and grain farming, specialty food stores, liquor stores, grocery stores, retirement communities, and stationery stores followed on the list, with profit margins under 2 percent. 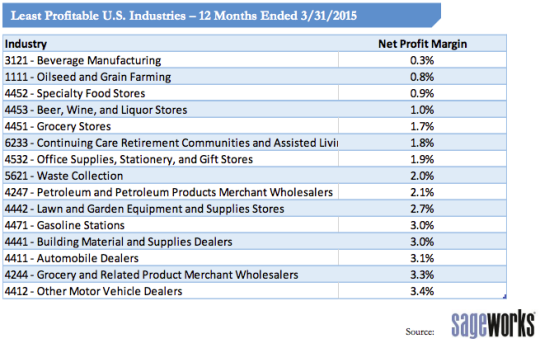 Of 15 industries identified as having net profit margins under 3.5 percent, more than half were related to the retail sector. Still, Sageworks analyst James Noe noted that industries with sub-par profit margin performance are still doing fairly well. “These industries are a little bit behind the pack, but they’re still profitable and growing profits in the past year,” he says. “That an industry with nearly 20 percent net profit margin growth is considered to be ‘lagging behind’ is an indicator of what sound shape private companies are currently in.” And it’s good news for the U.S. economy: Those private firms—overwhelmingly comprised of small businesses, mom-and-pop stores, and sole proprietorships—drive more than half of job creation in the U.S., Sageworks says. The full report from Sageworks is available online.